﻿My family love pancakes. So when my daughter mentioned it was Pancake Day, I had to make pancakes. These are great, they are spongy and soft and they are made with ingredients I always have in the house. My kids love them with nutella or a berry jam. The original recipe suggests maple syrup. Have them with whatever you like. If you take out the blueberries, you have normal pancakes, but my fruit loving family prefer them with blueberries. I tend to make mine pikelet size, but if you like them large, make them large. I prefer frying them in vegetable oil, as butter tends to burn. Place all the ingredients, except the blueberries in a blender and blitz. Stir in the blueberries. Place the flour, baking powder, salt and sugar in a bowl. Whisk in the eggs, butter and milk, until smooth. Stir in the blueberries. Let the batter sit for 20 minutes before using it. Heat a frying pan over medium-high heat. Spray with oil. Pour or spoon your batter into the frying pan (make them as big or small as you like). Once the upper side starts bubbling, it takes about 2 minutes, flip your pancakes and cook for approximately 1 minute more. 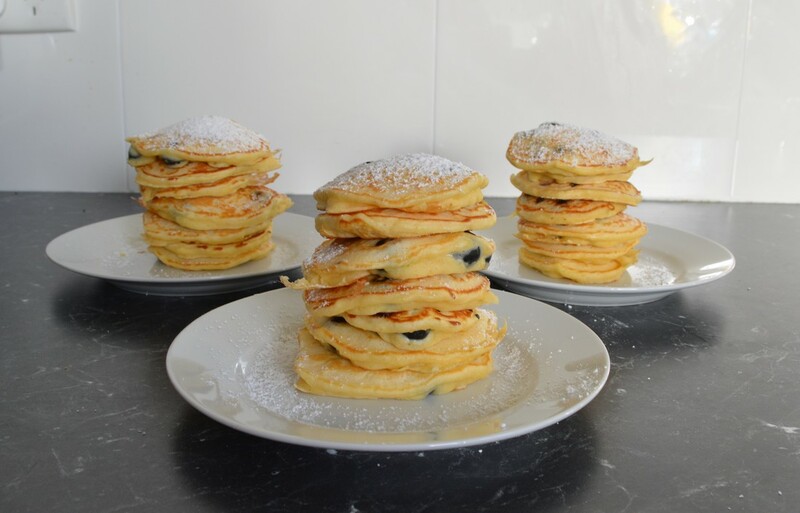 Stack them and serve with a dusting of icing sugar or whatever you like with pancakes.